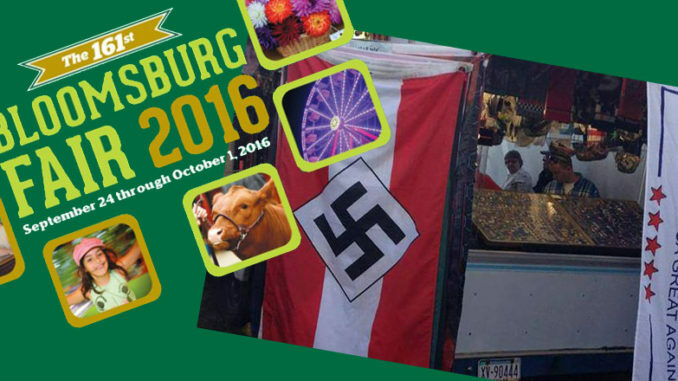 The Bloomsburg Fair’s opening weekend has been quite a public relations nightmare. As for being “unaware” of the humongous flag and other hateful merchandise this vendor had on display, I’m not sure I buy it. Especially when, reading through the growing number of negative reviews, I discovered that the fair’s security had confiscated money PSU students were raising to fight pediatric cancer. I don’t necessarily have an issue with them confiscating the money—according to WNEP, the students had been told three times that they weren’t allowed to solicit donations on the property before security took the money. And the fair promises to donate the confiscated money to a (different) charity. I bring this issue up because it speaks volumes to me that fair security was spending their energy kicking out students trying to raise money for a good cause while seemingly ignoring the vendor with the huge Nazi flag. Eventually, Bloomsburg Fair posted another update clarifying that Betsinger was asked to leave the fairgrounds Monday night after the fair closed. As for me, I’m appalled that there are still people who think it’s OK to hang Nazi flags. I’m even more appalled that there are enough people supporting businesses like this to keep them going. 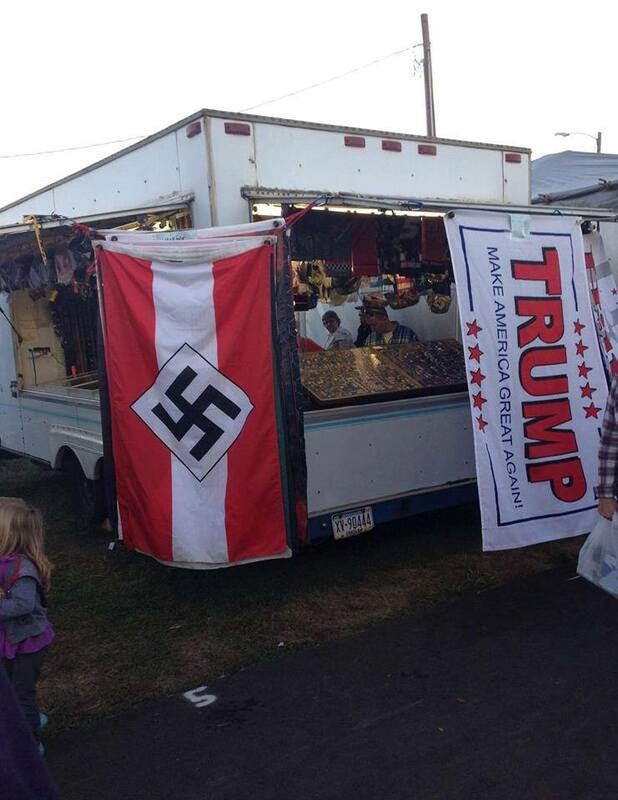 But what appalls me the most about this incident is that the Bloomsburg Fair—a supposedly family-friendly event—didn’t stop a vendor from displaying a flag that “represents the brutal and horrific genocide of innocent people” or from selling stickers praising a public health epidemic. The Bloomsburg Fair runs from September 24th through October 1. I suggest you don’t go.